The purpose of the club is to promote interest, fellowship and cooperation among persons interested in any facet of American Flyer S Gauge Model Railroading, including collecting or operating. We were originally founded in 1970 as the East and West Bay S gauge Model Railroad Club. 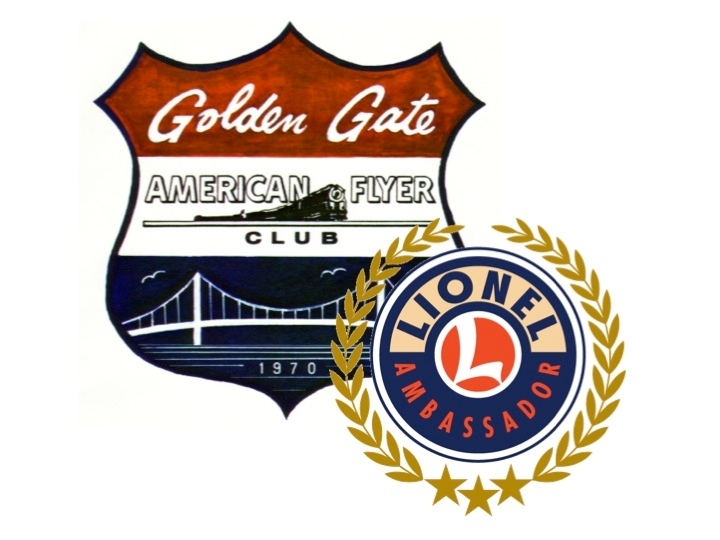 Today the Golden Gate American Flyer Club is group of American Flyer enthusiasts from all parts of the San Francisco Bay Area. We also have members in other parts of Northern California and even outside the state. We have a modular group within our club which displays its modules at various train shows in Northern California. See our Facebook page for some photos of our latest presentations at local train shows. Every three years we sponsor Flyerfest West. In other years, we coordinate with the Sacramento Valley American Flyer Club's Flyerfest West and the Southern California S-Gaugers, who sponsor S-Fest West. Both of these take place in the each of the two years between our Flyerfests. Our meetings are generally held on Friday evenings or Saturday afternoons at the homes of our members. A business meeting is conducted but the meetings also provide a chance to visit and enjoy the layouts of fellow members. Meetings usually feature a silent auction or raffle and an informal "show & tell" session which enables members to share interesting items with their fellow collectors. Click on the "Meeting Schedule" above for details. Copyright © 2016-2018 Golden Gate American Flyer Club - All Rights Reserved.